Ready for some more Pinspiration?! This month’s theme is applique. You do not need to be an expert sewer, but you will have to pick up a needle and thread! 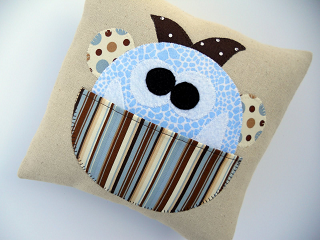 Description: These 10″ X 10″ tooth pillows are great for kids or grandkids! Beginner (teachable) sewing skills will be used, and we will rely on the more intermediate and advanced sewers to help with the pocket and closing the pillow. You are welcome to buy more than one tooth pillow kit, however remember that you will need access to a sewing machine to complete the project, and we will only have time to complete one pillow. Please click on this link to register for this month’s gathering. You will receive a confirmation email within 24 hours of registering. If you need to cancel, we will make every effort to sell your supplies to others at the meeting, but if we cannot please consider paying for your materials anyway. RSVPs must be submitted by Friday, May 25 so we can buy the materials in time. Ready to be Pinspired?! This month’s theme is ruffles and hot glue. 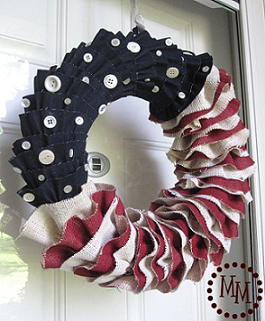 Description: This 12″ wreath is great for your door for the 4th, Memorial Day, Labor Day, or as a way to honor those who serve for us! Beginner (teachable) sewing skills will be used to make the ruffles, which are more of an in and out quick stitch, and you will need to bring a hot glue gun to secure the ruffles and buttons.